Home > Re-Use, Recycle > What Really is a Recycled Product? One of the problems when buying a ‘recycled product’ is that there is no standard definition defining what that term actually means. What really is a ‘recycled product’? When buying a product labelled as having been recycled then it’s quite reasonable to assume that the item being purchased is entirely composed of old used materials. Indeed that might well be the case, but as the present definition of ‘recycled’ means anything made at least in part by recovered materials, then the item could just as easily be comprised of 10% recovered materials and 90% virgin materials. This example highlights the problem consumers and businesses face when purchasing recycled products. How do you know the difference between one item which is made entirely for recovered materials and one which features only a small proportion when they are both advertised under the same banner? It is useful to gain a basic understanding of what goes into a recycled product and what the various terms mean so that you are more demanding of your recycled items and their manufacturers and take greater care in looking at the finer print on the labels. If a product is recycled then it means that it contains some materials that have been either recovered or previously manufactured. Recovered materials is a broad term that encompasses both ‘pre-consumer’ and ‘post-consumer’ materials. Pre-consumer materials – or post-industrial materials – are those that never reach the consumer and are the result of wastage from the manufacturing production process. They could include cut-offs and trimmings, as well as obsolete and damaged items. Post-consumer materials are those that have been used by businesses or a consumer and served their purpose, and then have been separated from the general waste stream as part of commercial, office and household recycling schemes. Such materials might include aluminium, glass, wooden pallets, corrugated boxes, printed papers and plastic containers. As there is an imbalance between the supply of reclaimed materials and the varying demands for it, there is an increasing appetite for reusing materials in all manner imaginative ways, regardless of whether they have any relation to their prior function. For example, old tyres are recycled as carpet underlay and hose pipes, waste newsprint is recycled into loft insulation and even plastic bottles are used to make clothes. Aware of the consumer’s growing concern for the nature of their so-called ‘recycled’ products, manufacturers are increasingly using terms to better define their goods. An item might, for example, feature a label claiming, ‘100% post-consumer waste content’ – which as we know means that it is made entirely using recovered household or commercial waste – or ‘100% pre-consumer waste content’, which means it was made from reclaimed materials recovered from the manufacturing process. 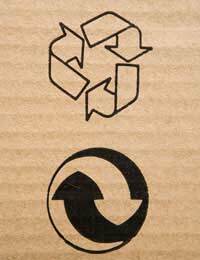 But if you were shopping for recycled products then which of the two would be more environmentally sound? As a rule, the higher the post-consumer waste content then the better a product’s green credentials because the post-consumer process is more supportive of recycling markets. It is therefore important that when shopping for so-called ‘recycled’ products you bear these points in mind and take great care to look are the labels closely. When shopping for recycled paper there are a couple of classification marks to look out for which signify a certain standard of production has been carried out. These are the ‘Blue Angel’ and the ‘NAPM’ recycled marks. In order to feature the Blue Angel symbol the paper brand must use a minimum of 51% printed and domestic or office waste in the production of their paper. Paper companies are also required to report on the energy used in the manufacturing process. In order for paper to qualify for the NAPM mark then it must be made from at least 75% post-consumer waste.